Graffiti Runner is a minigame in the game Mario Super Sluggers. It takes place in Bowser Jr. Playroom. The goal of this minigame is to paint as much of the ground as possible with the Magic Paintbrush. It can be found in Treasure Chests, which can only be opened with a body check. Whoever gets the most points wins the game. 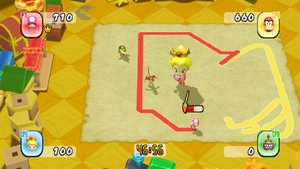 Points can get acquired by painting the ground, body-checking another character, or obtaining an item. The player earns 10 points with each step when holding a paintbrush unless the player is walking over his or her area. 50 points are earned for each successful body check, and 100 points are earned for each item acquired. The easier difficulties holds less chests than the harder difficulties. When players are playing in multiplayer, the max number of chests appear, regardless of CPU difficulty. Wii Remote + Nunchuk: Use Control Stick to move, shake to dash, press 'B' to perform a body check, press 'A' to jump. Wii Remote (horizontal): Use the Control Pad to move. Press 2 to jump; tap 1 to dash; press 1 and 2 at the same time to attack. Treasure chest - Body check it to reveal an item. Magic Paintbrush - Use it to paint the ground. Mushroom - Makes players gigantic, allowing them to cause earthquakes and daze grounded opponents. Airborne characters cannot create or be affected by earthquakes. Chain Chomp - Causes a giant Chain Chomp to rampage the field and make players lose some of their paint. Can push players or knock them aside. Super Star - Makes the player invincible, however the player can still get hit from a Chain Chomp or an earthquake caused by a Mega character. Invincible players knock aside anyone they touch. The duration of the invincibility lasts shorter if the player is holding the paintbrush while a Star is received. This page was last edited on March 8, 2018, at 20:43.